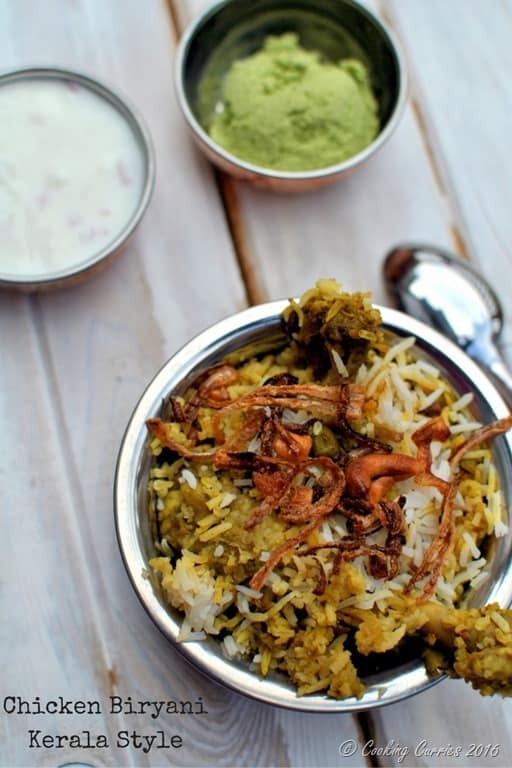 My adaptation of a Kerala Style Chicken Biryani that is best enjoyed with raita, biryani chammanti, pappadam and spicy lime pickle. It is so worth the time you spend making it! Trust me. I know at least 2-3 people who will be very happy that I finally managed to post this recipe 🙂 I made this chicken biryani the Friday after we got back from our vacation in Europe. Even though I enjoyed the endless varied delicacies while traveling, I was so very ready for a spicy plate of biryani. I also missed cooking something really elaborate. So this took care of both. I called over a few friends home and made this chicken biryani and a vegetable biryani. I have made biryani several times in the past but I must say this one was quite the winner. I think the earlier times sort of helped as trial runs and now I have perfected my go-to biryani recipe. Biryani came to India from Persia through early travelers, and the Moguls who invaded the northern part of India in the 16/17th century. 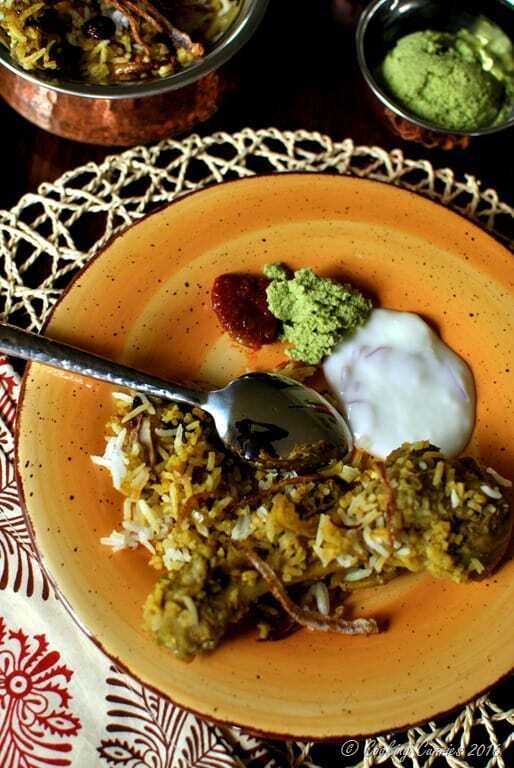 As more and more regions in India were exposed to this cuisine, everyone ultimately created a version of their own- from Lucknowi biryani and Hyderabadi Biryani to the Malabar Biryani and Thalapakatti Biryani. 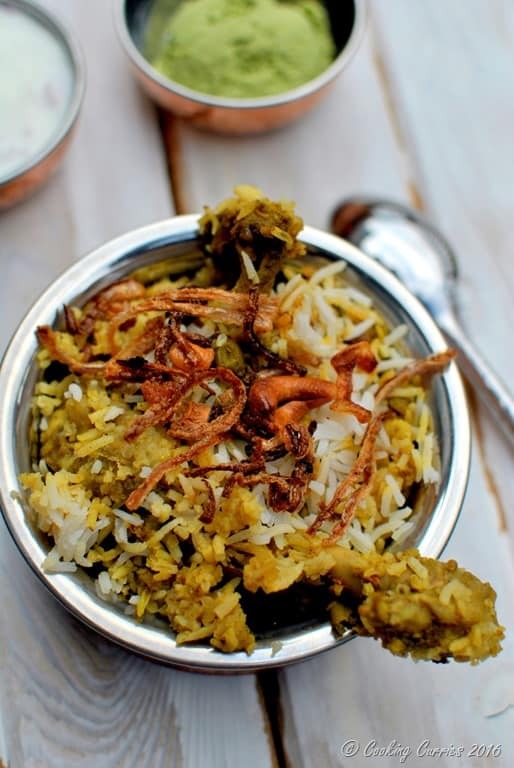 Even though the nuances in biryani making differs from region to region, the basic concept remains the same – basmati rice flavored with various spices and adding chicken, lamb or vegetables to it. 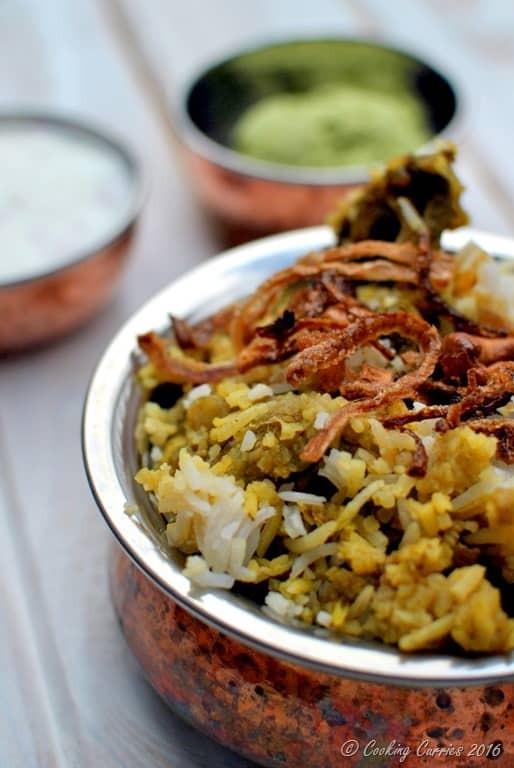 Biryani is usually served with a raita to go with it but in Kerala it is also accompanied by a coconut dry chutney or chammanthi as we call it and some spicy lime pickle. This is my version of a Kerala Style Chicken Biryani. It is a bit of a long drawn process, but I assure you, it is so worth it! Skin the chicken drumsticks and make tiny slits with the tip of a knife on the drumsticks, so as to help the spices to get absorbed better. Add the other ingredients for the marinade in a blender and blend well. Pour into a mixing bowl, add the chicken to it and mix well. Cover with a cling wrap and refrigerate for 3-4 hours or overnight, if possible. Heat the ghee (use oil if you are making it just for yourself and are health conscious. Don’t skip on the ghee if you are making for company) in a deep pan. Add the cinnamon, cloves, cardamom, star anise, mace, bay leaves and cumin seeds. Once the cumin seeds splutter and the other spices give out their aroma, add the onions to the pan. Sauté well and add the crushed ginger and garlic to it as well. Add the turmeric powder also. Once the onions are translucent and light golden brown, add the garam Masala and give it a stir. Add the tomatoes and salt to it and cook till the tomatoes soften and the ghee starts coming out from the sides. While the chicken gravy is cooking, get the rice ready. Wash the rice 2-3 times in water. Add the measured out water, salt and ghee. Cook on medium heat till all the water is evaporated and little air holes form on the surface of the rice. Keep the rice as is. Do not attempt to touch it or stir it as you don’t want the rice breaking at this point. Preheat the oven to 350F. In a rectangular baking pan / casserole, layer the rice and the chicken gravy, starting and ending with the rice. Cover with aluminum foil and bake in the oven for 15 mins or so. Mix the flour to the sliced onions and keep aside. Heat the oil in a pan and deep fry the onions on medium heat till they are nice and crispy. Drain on paper towels and keep aside. In the same oil, deep fry the bread pieces and drain them on paper towels as well. Heat the ghee in a small pan and fry the cashew nuts and raisins in it. 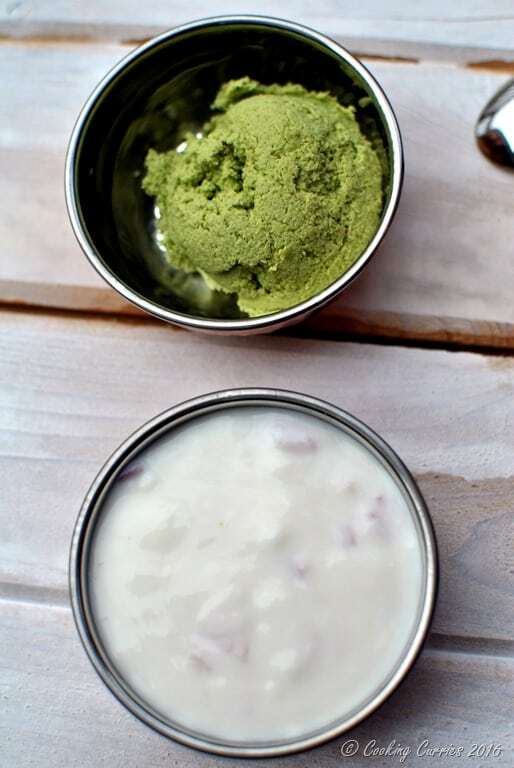 Grind them together in a food processor / mixer grinder to a very smooth paste. Serve with your biryani !